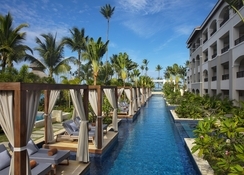 Secrets Royal Beach Punta Cana is a luxurious, colourful resort set against the picturesque backdrop of Punta Cana in Dominican Republic. Nestled amid palm trees, manicured gardens and sugar-white beach, this property is situated in one of the liveliest holiday destinations in the country that’s well known for its beautiful beaches, warm weather conditions and proximity to the historic city of San Domingo. The elegantly designed rooms and suites have satellite television, wireless internet connection, air-conditioning, en-suite marble bathrooms, king- and queen-sized beds and furnished terraces with Jacuzzis. Some of the other superb facilities on offer at the Secrets Royal Beach Punta Cana include excellent restaurants serving gourmet cuisine, well-stocked bars and lounges with premium drinks, luxury spa, theatre with entertainment shows, on-site casino, facilities for multiple sports (such as tennis, basketball, bowling, aerobics, dance classes, sailing, windsurfing, snorkelling, kayaking) and so on. The Unlimited Luxury packages provide all-inclusive amenities to guests, including unlimited access to dining and drink options, daily refreshed minibar, 24-hour room and concierge services, daytime activities and live nightly entertainment. There are elevators throughout the property, making this a suitable destination for disabled guests as well. 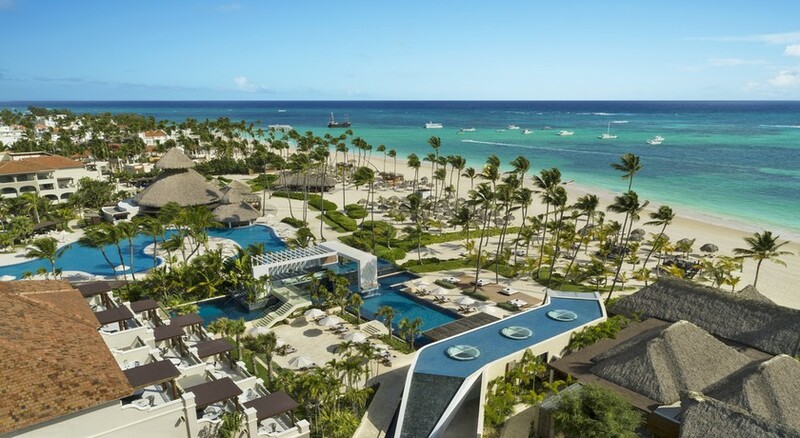 Secrets Royal Beach is located in Punta Cana, the easternmost province of Dominican Republic. The Punta Cana airport is one of the busiest and the best-connected airport in the Caribbean. Buses run throughout the town and the capital city of Santo Domingo is situated at a distance of roughly 198km and can be reached by bus in 2.5 hours. Macao Beach, a very popular public beach is situated at distance of 32.4km from Punta Cana. 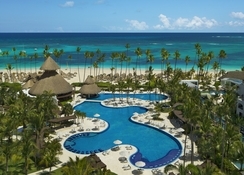 Secrets Royal Beach Punta Cana offers 464 luxurious guest suites, each featuring king- or queen-sized bed, full-marble bathroom, luxury bath amenities, furnished terrace or balcony with whirlpool, minibar, air conditioning, satellite TV, tea and coffee maker, in-room safe, free Wi-Fi and much more. The suites are classified into nine categories, each of which offers great views of the garden, pool or ocean, depending on the location. Guests can indulge in an expansive selection of international cuisine at one of the five great restaurants and a wine cellar, none of which requires prior reservation. There is Himitsu serving Asian fusion cuisine, La Riviera offering international cuisine, Oceana, which is famous for its gourmet seafood, Portofino for Italian delicacies and Seaside Grill for scrumptious, grilled delicacies. The wine cellar has an impressive selection of wines and is open from 6:30pm to 10:45pm. The cellar has a casual elegance dress code and forbids open footwear or sleeveless shirts or tops for men. 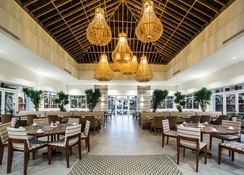 Guests can also access any of the restaurants and bars at the neighbouring Now Larimar Punta Cana and Now Garden Punta Cana. The 24-hour dining allow guests to enjoy late night bites at the Carnival Buffet, or opt for room service. 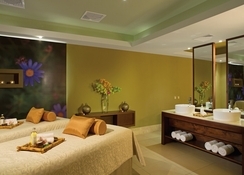 Secrets Royal Beach Punta Cana has a number of exciting options for spending quality time. 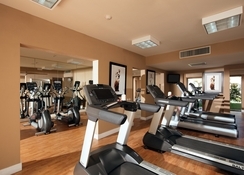 You can lounge on the private white sandy beach, take a dip in the free-form swimming pool, work out at the fitness centre, spend your day at the world-class spa or try out a game or two in one of the resort’s several sports grounds. The beach has options for indulging in water sports such as sailing, windsurfing, kayaking or snorkelling. 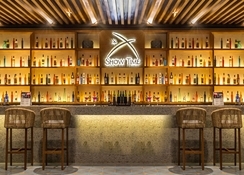 The hotel also houses a number of entertainment amenities that includes on-site casino, live music, indoor theatre, big-screen movies on the beach, aerobics and water aerobics, dance classes, theme nights, cocktail reception, shopping centre and nightly outdoor entertainment.